We have had more than 2 days of warm weather so that must mean Summer is here, and we are going to celebrate with all this new fabric! 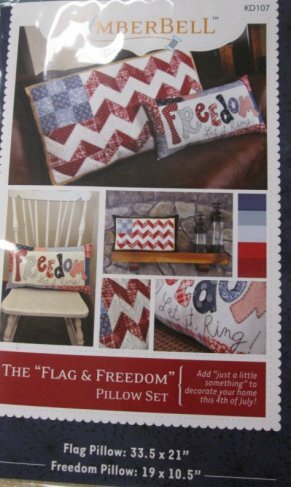 Kimberbell has the cutest pattern for a 4th of July pillow. It adds, "just a little something" to decorate your home for the 4th of July. We are working on making a sample and kits will be ready for you shortly. 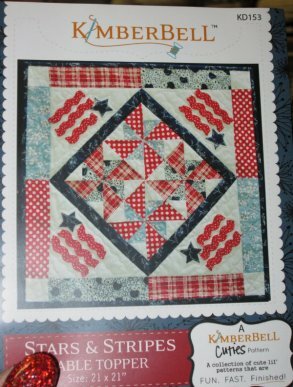 Kimberbell has also introduced a fun, fast and finished pattern for a 4th of July Table Topper. This is just so cute and we have several patterns so you can make and replace them as the seasons change. 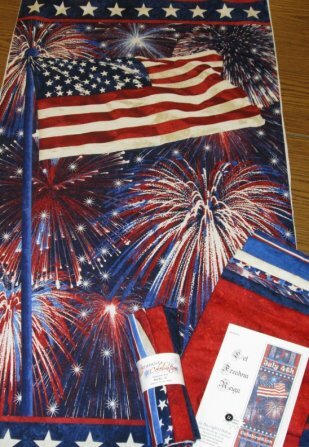 We have a striking 4th of July wall hanging that is sure to impress everyone. It comes in a rolled kit and the pattern is seperate. 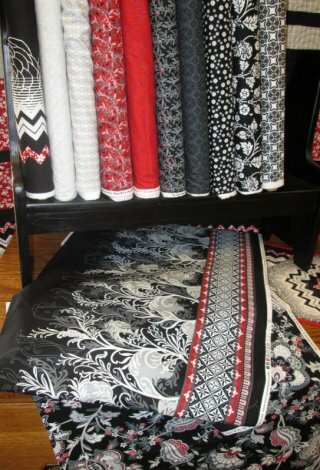 We just got this fabric in yesterday and it really makes a statement! I can't wait to see what we make out of it. 1. Fraying fabric is one problem when pre-washing fabric. How do you prevent this? A. Treat the edges of the fabric with glue. B. Cut a small triangular piece from each corner of the fabric. C. Put the fabric in a mesh bag. Please have a fun and safe Memorial Weekend. We will be closed on Monday, May 26, 2014 but will be open at regular hours on the rest of the days. Cutting a little piece from the corners will usually prevent fraying.